SEOUL, Oct. 24 (Yonhap) — After the television series “Dear Husband of 100 Days,” D.O. from popular boy band EXO might be remembered by his real name, Do Kyung-soo. The tvN’s historical series, also known as “100 Days My Prince,” in which Do takes the lead role, topped the weekly TV chart for the second week in a row, data showed Wednesday. The Monday-Tuesday series recorded a Content Power Index (CPI) score of 287.2 for Oct. 15-21, far outperforming “King of Mask Singer,” a singing competition show on MBC that came in distant second in the chart with 263.1. 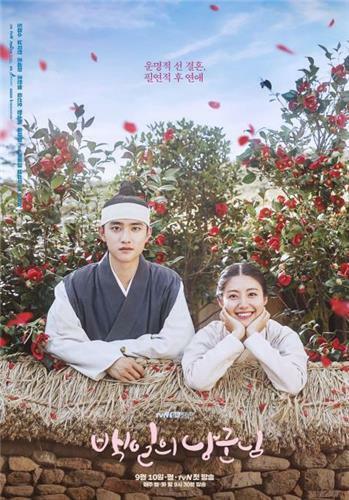 The series, set in the Joseon era (1392-1910), features an interesting love story between an unlikely couple: the prince — D.O. — loses his memory following an accident and gets to marry the country’s oldest single woman, who doesn’t know her husband’s true identity and thinks him useless and completely out of touch with reality. In the series, he plays two different characters — Prince E-yul and his amnesiac alter-ego Won-deuk — convincingly and with humor. The romantic comedy develops fast and successfully grabs the viewers’ attention. According to Nielsen Korea, its viewership rating pushed past 12 percent for its 14th episode Tuesday, a remarkable number for a cable channel show and the second-highest rating for a drama aired on the channel this year after “Mr. Sunshine” with 18.1 percent. The series now has two more episodes to go before wrapping up next Tuesday.